Maidenhair is a genus of ferns consisting of about 200 different species that are native to most temperate regions of the world. They have bright green foliage, often adorned with dark markings, and produce no flowers. Maidenhair ferns reproduce by tiny spores that are released from the undersides of the leaves. They are typically grown inside due to the need for high humidity and vulnerability to the sun. Place maidenhair ferns in a location that receives bright, indirect sunlight. Plant in a pot filled with a highly fertile and well-drained potting soil. Mix organic compost into the soil if necessary to increase these attributes. Water maidenhair ferns two to three times a week, but do not allow the soil to dry between watering. Keep consistently moist at all times. Do not allow the soil to become soggy, as this can promote root rot or fungal diseases. Maintain a high level of humidity around maidenhair ferns. Use a spray bottle to mist the foliage three to four times a week. Set the planter on top of a tray filled with pebbles and water to further increase the humidity. 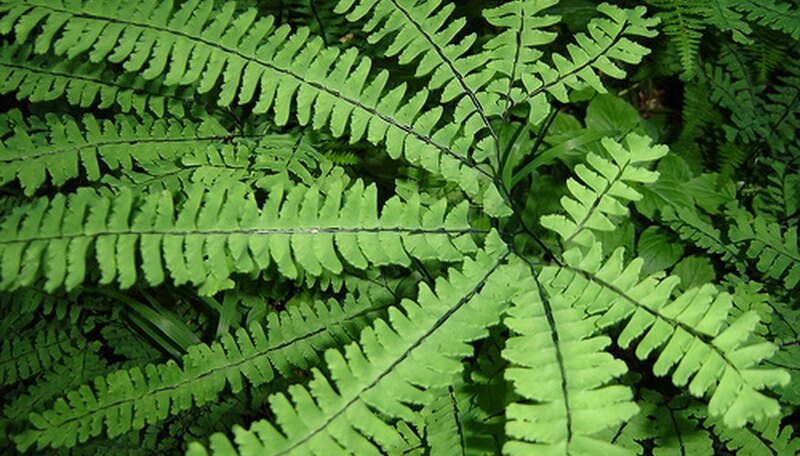 Feed maidenhair fern once a month using a liquid fertilizer. Dilute the fertilizer to half strength by adding additional water. Apply following the manufacturer's instructions for proper application and dosage. Remove any discolored, dead or dying fronds from maidenhair ferns as soon as possible. These fronds will draw excess nutrients from other portions of the plant, and will decrease growth in general. Maidenhair ferns can be grown in a bathroom which has high humidity levels. Alternatively, a humidifier can be placed near the plant to increase the moisture in the air. Keep maidenhair fern plants at room temperature, between 60 and 70 degrees F, at all times for optimal growth.